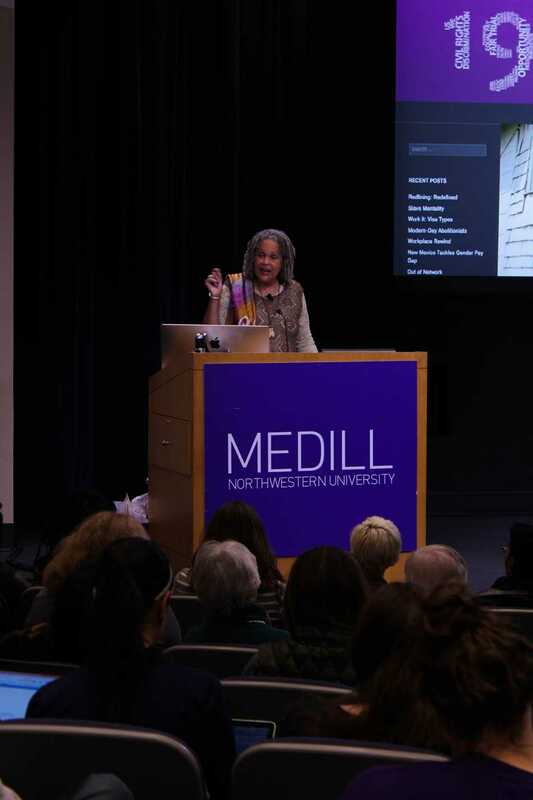 Former PBS and NPR correspondent Charlayne Hunter-Gault speaks at Medill about growing up in the 1960s. Hunter-Gault was one of the first two black students to enroll at the University of Georgia during the civil rights movement. When Charlayne Hunter-Gault decided to study at the University of Georgia in the 1960s, she did not expect to become a figure in the civil rights movement. Hunter-Gault, a former correspondent for NPR and PBS, came to NU as part of the One Book One Northwestern activity series this year that focuses on creating dialogue about race and identity. She was one of the first two black students to enroll in the University of Georgia. Speaking at the McCormick Foundation Center, Hunter-Gault described growing up in a society where she said the slogan “separate but equal” only meant separate. She recalled the time she was told by her university’s dean that she would be suspended for her own safety after an angry mob went after her. After graduation, Hunter-Gault decided the best way to support the civil rights movement was to report about it. She wrote stories about the police, who arrested and held young black men to create cases that would challenge the civil rights movement and keep segregationist laws in place. She was also involved with the Freedom Riders, a group of black and white civil rights activists who challenged the laws by riding public buses into segregated regions. She told the audience stories of the riders being targeted by angry mobs. Although the job was dangerous, Hunter-Gault said she was honored to be part of it. Addressing the crowd of mostly journalism students, Hunter-Gault highlighted the importance of the press. “See to it that every citizen, whether it is local or global, has news that are useful to them to make a better world,” she said.